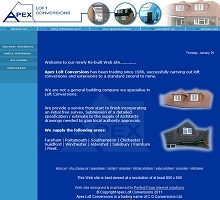 Apex Loft Conversions are an established company who specialise in loft conversions and attic extensions based in Fareham, Hampshire. Apex Loft Conversions can undertake conversion of a loft space into rooms such as another bedroom with ensuite, lounge or home office. The Loft Conversion work undertaken by Apex is guaranteed for five years other than where a manufacturer's guarantee applies. Apex Loft Conversions offer to undertake an initial free survey and a start to finish service including submission of drawings for local authority approval. Apex Loft Conversions offer Loft Conversions and Attic Extensions in Portsmouth, Fareham, Chichester, Southampton, Guildford, Farnham, Aldershot, Fleet, Winchester and Salisbury areas.